The Cisapadane Republic located in the north of Italy was founded under the protection of Napoleons armies. It was the first Italian state to use a tricolour flag with green, white, and red. Most likely inspired by the French tricolore. However, unlike the French flag, this was a horizontal tricolour, of red, white, and green. With the country's coat of arms located in the centre. However, the following year saw the Cisapadane Republic merge with the Cisalpine Republic. The Cisalpine Republic, in 1797, introduced a square flag, this time, a vertical tricolour. Bringing in the first flag that is directly linked with the Italian flag of today. 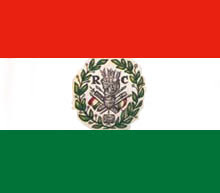 Under a proposal from Giuseppe Compagnoni of Lugo, the Cisalpine Republic decided to formally adopt green, white and red as its official colours. 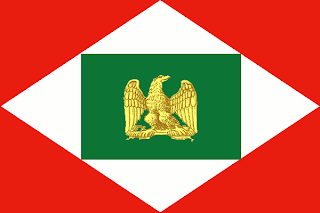 Red and white come from the flag of Milan, and the green came from the uniforms of the civic guard. Adopting a new constitution to allow the French First Consul Napoleon to become President, and it changed its name to the Italian Republic. 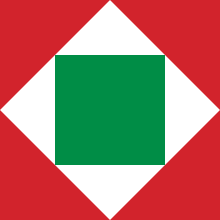 As a new flag, they brought in a flag with a red field, on which is a white lozenge, containing a green square. In 1805, Napoleon took the title of Emperor in France, and with it, he put himself as the King of Italy. The Italian Republic was reorganised into the Regno d'Italia, or Kingdom of Italy. The flag was altered from a square form to rectangular, and now had Napoleons Golden Eagle in the centre. However, Napoleon abdicated in 1814. There followed 30 years of Italy existing as several small states once more. However, in Italy, movements where abound to bring all Italian states back together. It was led by Piedmont in the north, and by the charismatic campaigner, Garibaldi, in the south.The Kingdom of Sardinia-Piedmont led the way in the fight for unity, and used an Italian tricolour flag, charged with the coat of arms of the House of Savoy. A red shield on which is a white cross. The shield is edged in blue, in order to separate it from the white of the Italian tricolour's centre stripe. 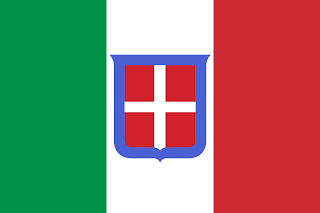 In 1861, the Sardinian flag was declared to be the flag of the new Kingdom of Italy, and in 1870, with the evacuation of France from Rome, they marched in, annexing the Papal States, unifying the whole Italian peninsula. 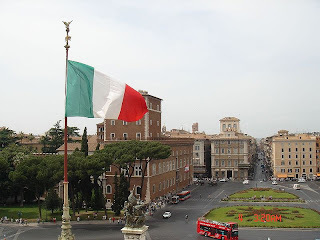 Finally, Italy's capital was once more, Rome.This flag lasted all the way to WWII. With WWII upon Italy, the Allies landed in the south, and opened the first western European front. The Allies made slow, but steady progress. Liberating Italy as they went. Mussolini had no choice but to flee north, and set up the Socialist Republic of Italy. This new republic was but a puppet state of Nazi Germany. Its flag was the Italian tricolour, without any embellishment. The war flag was charged with a silver eagle grasping a bunch of golden lictors. 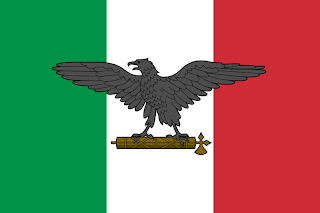 At the end of the war, the old flag with the coat of arms was returned, until 1948, when the current flag was adopted after a referendum had moved Italy from being a kingdom, to being a republic.